China launch new apple product, MacBook Air was released some days back with very beautiful look and affordable price. In the recent review Xiaomi has raised its profile in recent years on the back of affordable smartphones, branching out into everything from fitness trackers and media streamers to electric bicycles and rice cookers in recent months.Now, it’s venturing into a consumer PC market that's still largely in decline across the globe, its native China included. That said, on the surface, the Mi Notebook Air does look like a slim, stylish, and solidly powerful Ultra book at a relatively affordable price. The 13.3-inch model measures 0.58 inches thick and weighs 2.82 pounds, while the 12.5-inch model is a little slimmer and lighter at 0.51 inches thick and 2.36 pounds. Those aren’t the absolute thinnest laptops around, but to compare, the 13-inch MacBook Air is technically thicker and heavier, measuring in at 0.68 inches thick and 2.96 pounds. Both machines have an aluminum finish that comes in either gold or silver, and appears to be free of any exterior logos and markings. Xiaomi As CNET notes, however, the hardware itself comes from a partner called Tian Mi, but Xiaomi is selling it under its own name. This is something the company's done with other devices before. The specs on each model look solid for the price, though the larger notebook is the more impressive of the two. 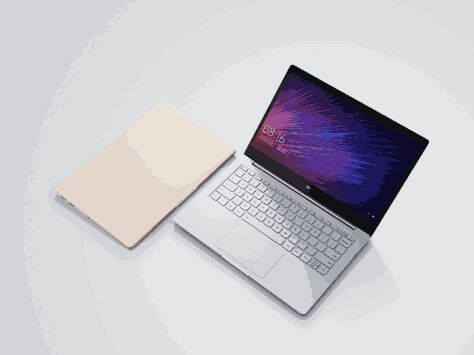 The larger 13.3-inch model features a 1080p display, a dual-core Core i5-6200U processor (so, it’s up to date),8GB of RAM, a 256GB SSD, and a battery rated at 9.5 hours of use. There’s a USB-C port, a couple of USB 3.0 ports, an HDMI port, and a backlit keyboard.Most notably, there’s also a dedicated GeForce 940MX graphics chip from Nvidia. That should allow for at least some level of gaming.